A damaged tooth can happen to anyone. Whether you cracked your tooth while eating a hard snack or your tooth crumbled due to decay, we are able to treat any dental issue you are facing. 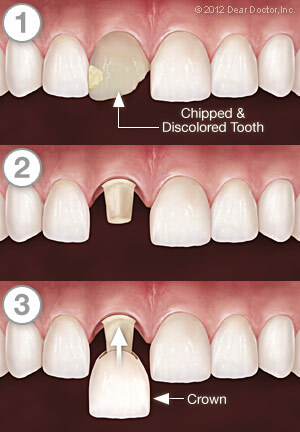 Our goal is always to preserve as much of the tooth as possible, whenever possible. If you have a weak, worn-down or damaged tooth then we may recommend getting a dental crown. A dental crown is a tooth-shaped cap that is designed to fit over your tooth to restore it back to its normal shape, color, appearance and strength. While tooth enamel is very resilient, it isn’t impenetrable, and there are many situations that can still cause damage to your smile. Dental crowns can be made from different materials including resin, porcelain, gold or steel. There are always advantages and disadvantages to choosing any of these crowns, but we would be happy to address these concerns and choose the crown that will be the best dental restoration for your smile needs. When it comes to getting a dental crown the process usually takes about two separate visits to complete. Once we deem you ideal for a dental crown the first visit will entail preparing the tooth for your new cap. Preparing the tooth requires us to shave down part of the tooth so that the crown can fit comfortably over the tooth. Shaving the tooth down can be rather extensive so it’s always performed under local anesthesia to minimize any potential discomfort. Once the tooth is prepared we will take impressions of your mouth. These impressions are sent to the lab where they will use them to create your custom-made crown. While your crown is being made we will fit you with a temporary crown to protect the prepared tooth from further damage. When your permanent crown is ready, you will come back to our office to have the temporary one removed. We will check the shape, color, bite and overall fit of your permanent dental crown before cementing it into place. A quick polish and your new restoration is good to go! And they can last up to 15 years, if properly cared for. Interested in fixing any damanged teeth? Sean R. Bates, DDS & Associates serve the communities of Osprey and Sarasota, FL. Call our office today at (941) 966-4751 to learn more about Dental Crowns!